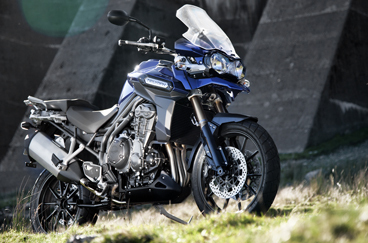 The Tiger Explorer is powered by an all-new, shaft-driven, three-cylinder 1200cc engine and debuts a new ‘ride-by-wire’ throttle system. Other standard features are cruise control, switchable ABS and traction control. The steel chassis has cast alloy wheels (19” front and 17” rear) and a single-sided swingarm. Options include hard and soft luggage, low and high seat options and a wide range of heated and electrical accessories.